Deactivating a user means that user no longer contributes to your paid licenses. Deactivated users cannot sign into Method, but you can choose to keep their user name listed within Method and assign them activities, send email notifications, and more. The following steps will show you how to deactivate and/or reactivate a user in Method. Click Customize. 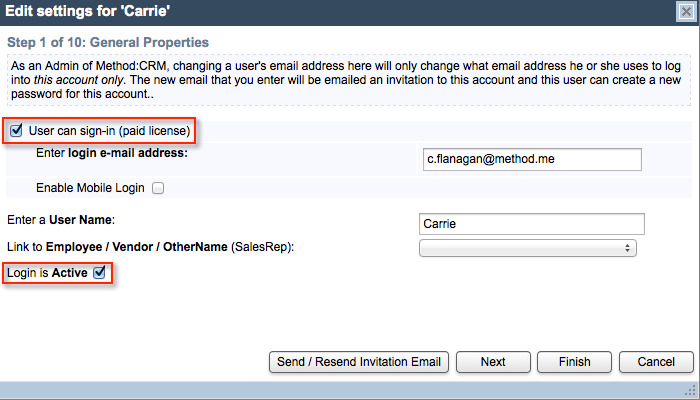 If you don't see the Customize tab, change the Tab Group/Role in the top right to CRM. If you still don't see the Customize tab, you might not have permission to see it. Contact your Method administrator for more details. Scroll down to the section marked Edit an existing User. Click Edit next to the user you’d like to make changes to. On Step 1: General Properties, you will see two checkboxes: User can sign-in and Login is Active. To deactivate the user, uncheck User can sign-in. If you still want the user to appear in Method (e.g. if you still want to be able to assign activities to them), leave Login is Active checked. If not, uncheck it. If you uncheck Login is Active but leave User can sign-in checked, your user will not be able to log into Method, but you will still be paying for that license. Click Finish to implement your changes. On step 5, recheck User can sign-in and Login is Active. Click Finish. Your user is now reactivated and once again contributing to your paid licenses. If you attempt to reactivate a user, but no longer have enough paid licenses to accommodate that user, this process will not work. You must increase your licenses.